As I write, we are in the middle of possibly the greatest event to be hosted in Great Britain since the 1966 World Cup. The Olympics come round every four years. However this particular Olympiad seems to have been with us for much longer. Since that day in July 2007 when London learnt that they were to host the games we, as a nation, have been building up to this moment and although we have all been supporting Team GB it really has been a Great British event. However it is all behind us now and time to look forward. The start of a new term beckons. Children starting school for the first time; moving from one school to the next or beginning the final leg of the educational process, leaving home and heading off to university for the Michaelmas term. Michaelmas, or the Feast of Michael and All Angels, is celebrated on the 29th of September every year. 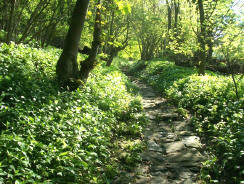 As it falls near the equinox, the day is associated with the beginning of autumn and the shortening of days. There are traditionally four “quarter days” in a year - Lady Day (25th March), Midsummer (24th June), Michaelmas (29th September) and Christmas (25th December). They are spaced three months apart, on religious festivals, usually close to the solstices or equinoxes. It used to be said that harvest had to be completed by Michaelmas, almost like the marking of the end of the productive season and the beginning of the new cycle of farming. It was the time at which new servants were hired or land was exchanged and debts were paid, and so Michaelmas came to be the time for electing magistrates and also the beginning of legal and university terms. St Michael is one of the principal angelic warriors, protector against the dark of the night and the Archangel who fought against Satan and his evil angels (Revelation 12:7-9). As Michaelmas is the time that the darker nights and colder days begin - the edge into winter - the celebration of Michaelmas is associated with encouraging protection during these dark months. Michaelmas marks the start of change and one of the changes we will be focusing on here in the Team Ministry is Messy Church. We have committed to this as part of our team vision and although it will be at St Nicolas on the second Saturday of every month it is very much a team effort. In the same way that the British Olympians supported one another we too must support one another in this new initiative. Jesus told his disciples that they were to be fishers of men (Luke 5:10). As we step forward in faith to “gossip the Gospel” (good news) in our community we too must do our bit to be fishers of men, spreading the good news of God’s love in our neighbourhood. We have had much to celebrate this summer, having seen Team GB eclipse all previous efforts with a record-breaking haul of medals. Having witnessed the sporting triumphs and gracious athletes in a stunning setting in early August, we look forward to the enjoyment and inspiration during the Paralympics towards the end of the month. Many of us did not manage to escape to sunshine and warmth this summer, so, to have our well-being lifted by this remarkable road to Olympic history has been glorious and brilliant. The Olympic flag is a very powerful symbol in that it sends out three important messages. Firstly, the five rings displayed represent five continents, Africa, the Americas, Asia, Europe and Oceania. The second significant message is that the five rings are linked. Sport should be seen as a means of bringing people of every colour, race and creed together across continents. In these moments of camaraderie, exhilaration of competition and excitement of winning and achievement, people can lose their inhibitions and become just human beings. The rings give us a great example of what the world should be like - nations linked together. It is a great achievement that Paralympics are now included and that sport supports equal opportunities. The third message is very clever. In the five coloured rings there is at least one colour for every flag displayed. Team GB’s flag has two colours. How many colours has yours? As we have watched and read the Olympic coverage, many will hold their hands up to a celebration in which we have discovered allegiances we never knew we had, in sports we didn’t know we loved. The athletes’ discipline and self-control is an image for us to hold onto. May the spirit of the Olympics bring fellowship and good- will. In this magazine you will find centre-page and front cover photos and articles of children at St Mary’s Infant School inspired by the Olympic Games. You will also find articles and photos linking elderly people with children, inspired by the Jubilee. Sue Read and Ruth Rudge have told us more about Messy Church, inspired by God’s love. You will also find many other articles inspired by love of music, community spirit and individual’s mission and vocation. Hannah Bennett has kindly written her introduction to the Parish. It is her inspiration for the growth in young people which has led her to be our new Youth Development Worker. How many of you have attended the Olympics/Paralympics in London? Please e-mail us and tell us what you thought of the athletes, venues, crowds and noise!! Our theme for the October Magazine is HARVEST, and for November, REMEMBRANCE. The Editorial Team looks forward to receiving your articles, observations, photos and drawings over the coming weeks. In March 2000 I interviewed Andy for the full-time post of Youth Worker in the Parish of Prestbury. In his file I still have the notes I made with a long list of things that were positive about him. The list includes, ‘experienced, well researched and prepared, would go down well with the young people, has natural authority, is able to cross the age-ranges, common sense, good judgement, a team player, someone who will share his faith’. How accurate that list has proved to be over the more than 12 years that Andy has been with us! The role of youth worker has changed and developed as Prestbury was joined by All Saints and later Swindon Village, St Peter’s and Elmstone Hardwicke to become the North Cheltenham Team Ministry, and as the Prestbury and Pittville Youth charity was formed. The youth work, under Andy’s outstanding leadership, has also developed and flourished, connecting with literally hundreds of young people in this area over the years. Andy has also been inspirational in encouraging volunteer leaders of all ages and supporting them in their roles across the various youth groups. Under his leadership, the work of PPY has gained an excellent reputation both locally and also within the Diocese of Gloucester. In October 2006 Andy was licensed by the Bishop of Gloucester as a Youth Minister and Lay Worker, reflecting not only his role with young people but also his role as a leader within our parish team. He has been a highly valued member of staff and I have particularly appreciated his prayerful wisdom and his unfailing support, enthusiasm, encouragement and sheer hard work! At the time of Andy’s appointment he and Sharon were living in North Leigh in Oxfordshire, where Sharon was employed as a youth worker. When they relocated to Cheltenham, Sharon began work as a volunteer leader and so we have been very fortunate to have the benefit of her experience and her abilities as a youth leader, and we’ve had all that for free! Also since the Macaulys came to Cheltenham, we have welcomed Ben and Grace, and we are delighted that the whole family will continue to be part of our church family and local community, worshipping mainly at the Celebrate! service at St Mary’s. Andy and Sharon were both key members of the group who launched Celebrate! and they have remained as committed members of the leadership team, Andy regularly leading the worship and Sharon using her musical gifts in the worship band. In September, Andy will be taking up a full-time post as Director of Education at The Rock at St Peter’s, working particularly with young people who have been, or are at risk of, exclusion from mainstream education. It is almost impossible to imagine PPY without Andy, and it is also almost impossible to put into words the value of the contribution he has made. We give thanks to God for sending him to us all those years ago and for the many ways in which He has blessed the work with young people which Andy has led. We will be attempting to put into words our thanks to Andy during a special celebratory evening at St Nicolas on Saturday 1st September. All are welcome to attend the evening which will start around 6.00pm. There will be a pig roast, bar, music and some worship. We hope that former members of the various youth groups and former volunteer leaders will join us – all are welcome! As you read this article I will have finished my ‘leg of the race’ as PPY’s Youth Development Worker and Youth Minister for North Cheltenham Team Ministry. 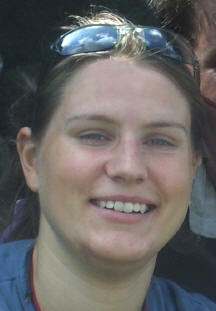 From 1st September Hannah Bennett will take over as PPY’s Youth Development Worker. It is great to be handing over to such a talented and committed youth worker who shares so much of what is at the heart of PPY. Looking back it has been very much a team effort. I am immensely grateful for this opportunity to work alongside such great young people and volunteers in North Cheltenham. It seems a world away when I first took on the role with Prestbury Parish alongside my youth work training. I have very much valued the support of Fr Michael and the Executive Committee as I have developed. It has also been a team effort as a family. Sharon has been a key part of the youth work (and will continue to be involved). The whole family have made sacrifices to make the youth activities possible and have also shared in the many joys of spending time with young people. As a family we still feel a strong call to this church community and are very pleased that we will be able to continue to worship in the North Cheltenham Team. Most of all, it has been fantastic to be aware of God working through the youth work – especially in providing people and resources to provide fantastic opportunities for young people. One of my highlights has been seeing young people living out their faith in very different ways in what is an increasingly challenging world. I know that God has so much more He longs to see happen for local young people in North Cheltenham. Baton changing can be a risky process, but the relay is so much more effective than running it all on your own! Please pray for Hannah as she runs her leg of the race in this place and with these wonderful people. Please also keep praying for me as I continue to try to follow God’s call at the Rock, supporting young people who struggle with education. We look forward to seeing many of you on 1st September. Prestbury and Pittville Youth (PPY), the charity that runs the youth work in the North Cheltenham Team Ministry, are delighted to announce the appointment of a new part-time Youth Development Worker who will work across the Team Ministry. Hannah Bennett will start work on 1st September and will be employed for 20 hours per week on a one-year fixed contract. Hannah will also work an additional 5 hours per week in a fundraising role and we hope that funding will become available for the work of PPY to continue. Please keep Hannah in your prayers as she takes up her role and pray that God will bless her in this new work. Andy has done a fab job of handing over to me, and he has already introduced me to several of the groups I will be working with. When he asked me to introduce myself, my response was “I’m the new Andy!” He has done a fantastic job with these groups and by all accounts I have a lot to live up to. I hope to continue his good work and build on what PPY has to offer. I have recently finished a degree in youth and community work and practical theology. Before my degree I spent three years working as an outdoor pursuits instructor at the Christian adventure centre, Viney Hill. I particularly enjoy mountain walking to the extent that my husband proposed to me on top of Scafell Pike in the Lake District. We are both passionate supporters of Gloucester Rugby Club, so apologies to football fans out there, but rugby is best! I find watching it a great way to relax or unwind. We also have a collie called Oscar who has a great character. I have a passion for inspiring growth in young people and adults and have spent a lot of time over the past years learning about the importance of community. Throughout all of this, my faith as a Christian has been the key to how I work. One of the modules I have undertaken as part of the degree involved church and mission. As part of this I developed the following personal mission statement which is integral to the work I do. My personal mission is: “To evolve outwards, not being afraid to try new things and experience together different cultures and what God is doing in them”. From what I have seen so far, PPY is blessed with a great volunteer team and I am really looking forward to starting, becoming part of the community, and getting to know everyone better. There are a few things in life that are one-off events that you can’t ever expect to happen to you. On Saturday 21st July the Archbishop of Canterbury was at Gloucester Cathedral during his visit to the Diocese. 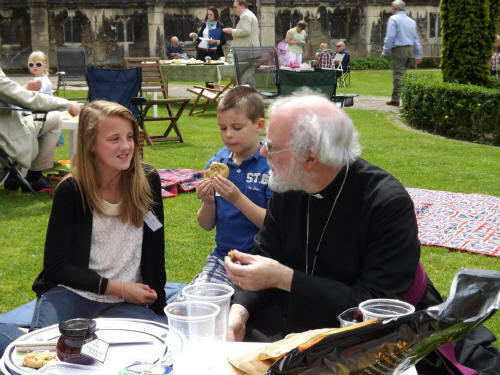 As part of the occasion a number of families were invited to participate in a picnic during which Archbishop Rowan would meet families from around the Diocese. This was decided by random selection from within each deanery and St Nicolas was lucky enough to be selected. From St Nic’s one family was then invited to attend the private picnic with Archbishop Rowan. Fr Michael asked if we would like to attend along with mum and dad. Therefore Lee, myself, Chloe, Dylan and Erin got dressed up for this special occasion. Only 10 families were invited to this one hour picnic in the private cloister gardens which took place during the Shine A Light Festival. At first I felt a little overwhelmed and wasn’t sure we were worthy of this. However I wasn’t going to miss this opportunity! As thoughts turned to the picnic I began thinking about preparing some snacks and getting myself a nice picnic basket as my freebie cool bag from Marks and Spencers some years ago wasn’t really at its best!! When we arrived we were taken through to the cloister garden which was prepared ready with chairs and decorated with beautiful bunting. 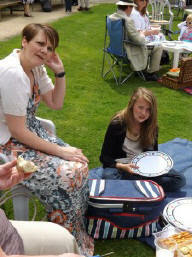 The children were spoilt with lots of cake and sweets along with our own picnics. Erin who had just found her feet, enjoyed taking those tentative steps and marching around the cloister! The Archbishop arrived and spent time with each family, he asked the children all about school and what they liked doing. Chloe had made some chocolate dipped strawberries and offered him one which he took and ate. On the day, meeting the Archbishop was an amazing experience. He was such a gentle, caring man who easily chatted with the children. Chloe also put him on the spot asking why bad things happen in the world. He gave her a good understanding of free will in his answer and was able to explain this in a relevant way for her to consider. The day was great and Gloucester Cathedral was alive with activities for families, with some amazing music in the background, (our own Celebrate! band taking part) and countless opportunities for the children to have fun. It was also great to see many friends from both St Mary’s and St Nic’s; it was certainly an occasion. 'Messy Church Logo Copyright Bible Reading Fellowship © 2012. What is it? A nationwide, established and growing “fresh expression” of church; a God centred time of activites, worship and food; warmly inclusive of children but not for them alone. Why do it? To share the Good News about Jesus Christ. Where is it? At St Nicolas’ Church and Hall, Swindon Lane. When is it? 3.30 – 5.30 13 October, 10 November, 8 December, and monthly on the second Saturday thereafter. Who’s it for? People of any age but not in regular touch with church. How? Supported by your PRAYERS and fundraising efforts. Secondly by supporting, or arranging, a FUNDRAISING event. Please guide our venture into Messy Church. May everyone have fun and begin to get to know you better. Watch out for us on Facebook. St Mary’s C of E Infant School usually begins every term for its six classes of 4-to-7 year olds by choosing a theme. The theme is used to guide all sorts of activities linked to the national curriculum, including literacy, drama, art, history and sports. The theme for the summer term 2012 was an obvious choice: ‘Our World of Sport’, based around the Olympics. The Headteacher at St Mary’s, Miss Ann Fitzpatrick, explains the choice: “‘Our World of Sport’ was chosen because of the presence of the Olympics and the fact that this will probably never return to the UK this century. This presented us with a once-in-a-lifetime opportunity to use the ‘magic dust’ of the Olympics, in as many ways as possible, for the benefit of the children. A variety of projects was planned across the curriculum, with the all-embracing aim of increasing even further our children’s participation in sport, physical activity and culture. Quite simply we wished to use the inspirational message of the Olympics to raise their aspirations and hence attainment. We want our children to be the best they can possibly be. 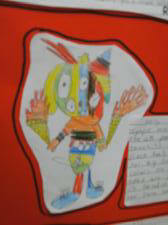 We also used the Olympic and Paralympic values as a vehicle to develop the children’s understanding”. Design a mascot and an Olympic winner’s tale! The activities were wide-ranging. 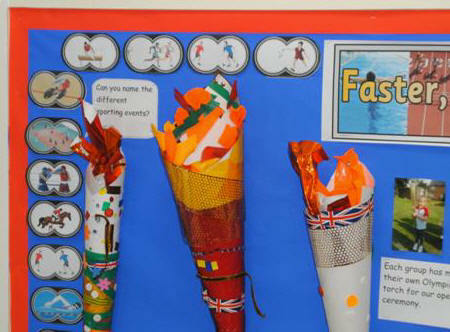 In each of the classrooms, the children were encouraged to create and bring in items for an Olympic display, showing and sharing their understanding, discussing the event history and demonstrating related values. Contributions ranged from models of the Olympic torch, photographs and artefacts, to stories about competing and winning gold! In Year 1, for example, the children each designed and named their own Olympic mascots, and used them to represent various values they had chosen. Every Wednesday, the children wore sports kit to school and took part in sporting activities. 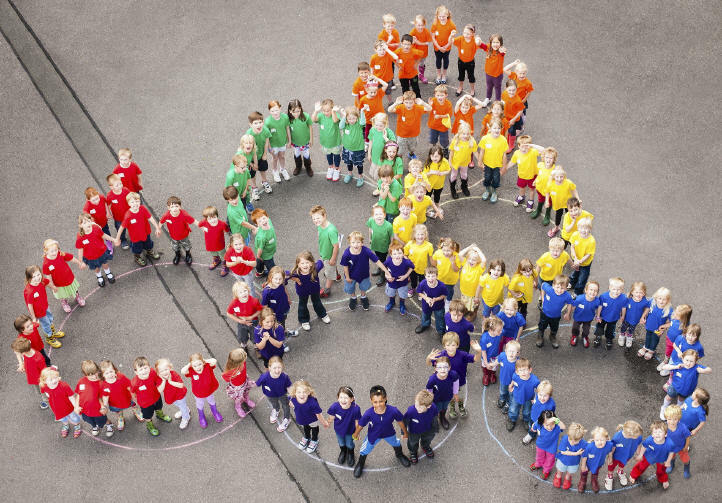 They also held an Olympic-themed sports day, and at the school fete, wore coloured t-shirts to form their very own unique Olympic rings logo, photographed from above with the aid of the local fire brigade! The quite stunning picture, taken by Simon Hayward Photography, is shown on our front cover for you to enjoy. 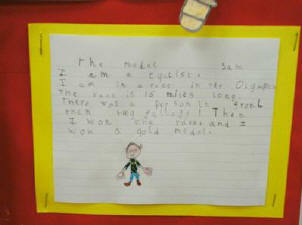 I interviewed some of the children at the school to discover their understanding of the Olympics and its values. The children are all under 7 years old, and some of their views, whilst innocent are quite inspirational. According to Sam, aged 6 (and a half!!) “The sports are very exciting and there are all kinds of different ones. I want to do trampolining when I am a grown up as you have to bounce very high before you can turn over. The (athletes) work very hard every day to get so good. The people who do the Olympics come from everywhere, even Africa, which is quite far you know”. By the time you read this, the Olympics will have ended for another four years, the medals will have gone home with the winners and the stadium will be empty. Yet far from being a flat event viewed on the television and forgotten, the children at St Mary’s Infants will remember that they lived and breathed the Olympics through activities and events that really gave them meaning for and contributed towards their aspirations. Who knows which pupils will go on to excel in the sports arena? 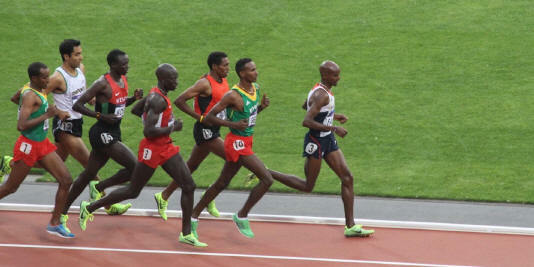 This amazing sportsman, Mo Farah, photographed by friends of Jean Johnson on his way to victory in the 5000 metres race. He passed the baton in the race against hunger to David Cameron as the Global Hunger summit fired the starting gun on the push against hunger. Hungry jubilee street partygoers have helped Abbeyfield Prestbury raise £57.00 for the Parish Council’s World War Two memorial fund. In just a few hours, all the cakes, sweets and biscuits on sale at the retirement community’s table for the village’s jubilee day celebration in The Burgage had sold out. Helen Davis, Abbeyfield Prestbury’s house manager, praised the volunteers and friends who baked and donated the tasty treats and said the money would be given to the council this week (week commencing 11th June 2012). 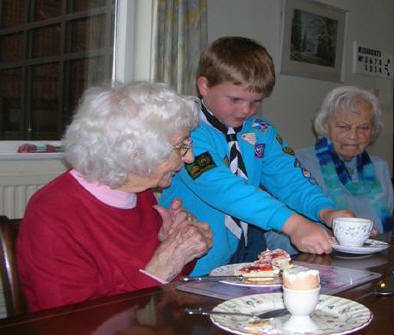 A group of Beavers* and Scouts delighted pensioners when they visited their Prestbury home to serve a teatime treat. 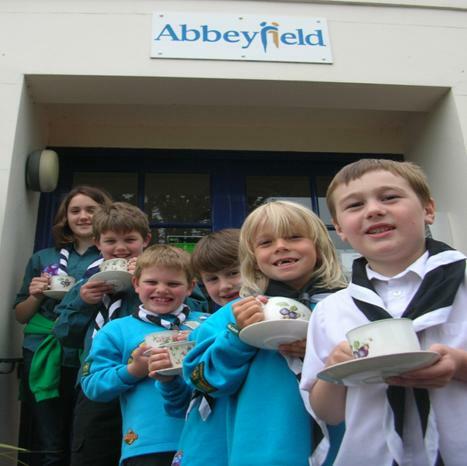 It was cups of tea and cream strawberry scones all round at Abbeyfield Prestbury thanks to the youngsters from 1st Prestbury Scout Group, who were earning their Friendship Challenge and Creative Challenge badges. Scouts Rachel Jackson, 13, and George Silcock, 10, were also on hand to help the Beavers prepare, along with five leaders. Helen Davis, house manager at the Prestbury Road retirement community, said that the five residents having tea on Tuesday (12th June) were thrilled to be waited on by the seven and eight-year-old Beavers. She also added that the Beavers really enjoyed the occasion, especially the scones! Helen helped organise the visit as part of the national Abbeyfield Week, which encourages residents and younger people to share skills, experiences and interests. Linda Jackson, Group Scout leader, said the youngsters enjoyed meeting the residents and chatting to them about their badges at the special tea. “Our young people liked hearing their Scouting and Guiding stories, and by serving the tea it means that they’re all one step closer to completing their Friendship Challenge and Creative Challenge badges,” said Linda. *Important note: five Beavers visited but one did not have parental consent to be named or pictured, and hence is neither shown nor identified (so only two Scouts and four Beavers appear in the line-up picture). 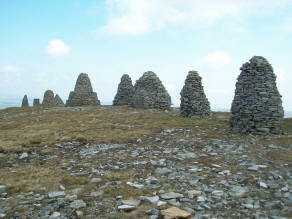 The intervening days between the Lake District and Yorkshire Dales provided a significant change of environment: limestone plateau poking through the grass, evidence of many pre-historic settlements, and rolling moorland as far as Kirkby Stephen, passing through the Smardale Gill National Nature Reserve. This was (mostly!) easier walking and just as well, as the Shap-Kirkby stage was twenty miles long. 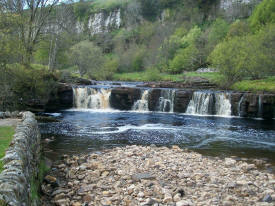 Between Kirkby and Keld – at the start of beautiful Swaledale – the climbing took over again, ascending Hartley Fell to the dizzy heights of Nine Standards Rigg, the Pennine watershed whence all watercourses to its east flow into the North Sea and to its west into the Irish Sea. Descending is via one of three advised routes depending on the season (i.e the weather!) – I was on the May-July “Red Route” – but this didn’t save us from having to navigate through the bogs without sinking. And that’s no exaggeration; the Air Rescue service had recently had to be called upon to haul out one lady who had sunk up to her armpits after a misjudgement, so “navigate” has the appropriate watery connotations! Setting off from Keld along Swaledale, with views of several picturesque waterfalls (“forces” as they are called oop ‘ere), after briefly intersecting with the Pennine Way, I detoured past Crackpot Hall (yes, really!) – long abandoned because of mining subsidence - and up Swinner Gill ravine on the lower reaches of Melbecks Moor, to view the derelict remains of one of the old lead mines, once a thriving industry in this area in the 17th and 18th centuries. The ravine, or “hush” as it is known in mining terms, is artificially created by releasing dammed water from above which scours off all the surface soil and vegetation to reveal the mineral beneath. From here I descended to the Swale again and spent a very pleasant day walking along its banks to Reeth, my overnight stop at a mountain bikers’ hostel. Although the weather was starting to become seriously warm, Reeth to Richmond was almost like a day off, in advance of next day’s 23-miler to Ingleby Cross at the start of the North York Moors. After passing the old Marrick Priory – now a Ripon Diocese adventure centre - I ascended the so-called “Nunnery Steps” (375 of them!) through a mercifully shaded, picturesque wood. Traversing a former deer park to the village of Marske, the path took me onwards along the dale, with the River Swale to my right and the majestic limestone cliffs of Applegarth Scar to my left. To the end of this scar is “Willance’s Leap” where a certain Robert Willance out riding tumbled down the precipice; his horse was killed but he himself survived and presented to the town of Richmond – my destination for the day – a silver chalice as a thank-offering. The chalice is now preserved as one of Richmond’s many treasures. Richmond itself is one of the few substantial communities along the walk, with a Georgian Theatre, a castle and keep looming over the Swale, the school which Lewis Carroll attended, and a busy, cobbled market square in the centre of which is Holy Trinity “church” – actually now home to the Green Howard’s Museum. The sprawling Catterick Garrison is also located nearby. A very pleasant overnight stay at St Giles Farm, with a fine meal at the local Farmer’s Arms, provided ideal preparation for the following day’s marathon - of which more in the final instalment next month. 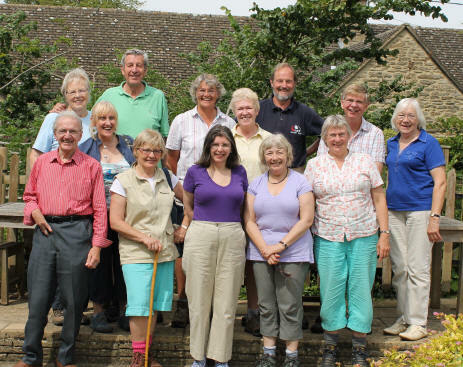 “Intrepid walkers”, led by Janet Waters, enjoying a welcome lunch at the Elliot Arms after a five-mile walk around the Cotswold Water Park. On 27th June Dean Close School performed a morning concert of vocal and instrumental music. Christine McKelvey welcomed the musicians, Head of Music and accompanist Helen Porter. She also thanked Maggie, Mary and Joan for welcoming everyone with refreshments upon arrival. The audience comprised Bay Tree Court Residents and their carers, DCS Staff, parents of Old Decanians and Prestbury Residents . They listened to and enjoyed performances ranging from Bach, Brahms, Beethoven, Rachmaninov to Milhaud, on the oboe, clarinet, cello and violin, and songs from Bach’s St Matthew Passion and Beethoven’s Exultate Jubilate. The soloists and Trio played and sang beautifully and professionally and no-one wanted the concert to end. The musicians lifted a drab and wet morning and it was a privilege to listen to young talented musicians, one of whom has played annually at St Mary’s during her 5 years at DCS. Father Daniel gave the closing address, highlighting how music can touch every part of life and permeates the whole of who we are. So the LORD said to Moses, ‘Take Joshua son of Nun, a man in whom is the Spirit, and lay your hand on him. Make him stand before Eleazar the priest and the entire assembly and commission him in their presence. Give him some of your authority so that the whole Israelite community will obey him. ‘Succession planning’ – thinking about who might take over a particular job or role when the current occupant leaves. It could involve asking people to join the coffee or readers’ rota, or finding someone to edit the Parish Magazine or lead the Mothers’ Union branch. This autumn our schools’ governing bodies will choose their chairs and vice-chairs; next spring we shall elect our churchwardens. If someone has been in a role for a long time, it can be daunting to consider taking their place. Finding out more about the job beforehand could alleviate that worry. Moses, appointed by God rather than elected by the people, led the Israelites for forty years, bringing them out of Egypt and through the wilderness. When he learned that he would not be going any further, his first concern was to ask God to appoint a successor, so that the people would not be ‘like sheep without a shepherd’. God’s response was to name Joshua as the new leader who would take the people into the Promised Land. We do not know what Moses felt at not completing the mission he had started all those years earlier, nor what he felt about handing over to someone else. We do not know how prepared Joshua was to take on such a huge task; nor are we told his thoughts about following in the footsteps of so great a leader as Moses. What we do know is that Moses prayed about it and that God answered. God chose Joshua and insisted that he be commissioned officially and publicly. There was to be no disputing that Joshua was the new leader and no questioning his suitability. What about us today? Perhaps you are being asked to hand over a role you have occupied for a long time. Pray about it. See if God names a successor. Perhaps you are being asked to take on something new. Pray about it. See if God is suggesting that you relinquish some other task to make room for it. Sometimes we do not feel competent to take on a particular role. We can pray about that too, and then take time to find out more about it. Shadow the person currently doing the job. It might confirm that we are not the right person for this task, or we might realise that we could take on that role for a while. When Elijah wanted to give up being a prophet God sent him to anoint Elisha as his successor (1 Kings 19). Elisha left what he was doing and became Elijah’s assistant, ‘shadowing’ him, learning on the job. We can do that too. Some years later, when it was time for Elijah to leave (2 Kings 2), Elisha followed him to the end, acquiring his cloak and all the authority which went with it. If God has called us, then we can have the confidence that he will enable us to perform the role, and that he will be with us, as he was with Joshua. Many of you will be familiar with the aims of the sponsored event known as ‘Ride and Stride’ which has been held for several years. This event is not just confined to our county but is run in many other counties in the country. The principle aim is to encourage people throughout the area to participate in sponsored rides, walks, and other tasks and to obtain sponsorship from friends, neighbours etc.. Following the event to be held on Saturday 8th September the money is collected and forwarded to the organisers who are based in Cirencester. The money is divided 50 / 50 between the Ride and Stride fund and the Church nominated by the individual participant, in our case, probably St Mary's or St Nicolas. The money that is held in the central fund is used to supplement the costs of repairing / maintaining the fabric of churches in our diocese. Please do come along to meet with the Archdeacon at any of the services taking place during the day. It would be great to see people at morning or evening prayer! The next bakestall will be on Sunday 16th September. The N-Z team will be providing this time. This annual charity concert is popular with adults and children. It is held in an informal atmosphere seated around tables, and there will be choirs and dancers from local schools taking part. Kenya Projects UK (charity no 1129255) was founded by The Revd Maz Allen of URC, and supports St Stephen’s Children’s Home and Utugi Boys’ Home for street children in Embu, Kenya, and the Gatondo Health Clinic. Currently we are raising funds for a bore hole to supply clean water to the Health Clinic, and to provide a carpentry workshop for the Utugi Boys’ Home. I will be visiting the projects with a group (all self-funding their trip) in January 2013. For any further information please contact me, and please support this concert. A celebration of the 350th anniversary of the Book of Common Prayer in words and music. As well as a handbook of public worship, the Prayer Book is a companion to the big milestones of life (birth, childhood, adulthood, marriage, illness and death), helping us express pain and sorrow, joy and gratitude. The music includes Handel’s ‘Come unto him’, SS Wesley’s ‘Lead me, Lord’, John Ireland’s ‘It is a thing most wonderful’, Charles Villiers Stanford’s ‘Te Deum’ and Geoffrey Burgon’s ‘Nunc Dimittis.’ The words include not only the incomparable language of Cranmer and his successors; but also examples of how the Prayer Book has affected people’s lives over the centuries. Concert trio ‘In Voice and Verse’ received rave reviews last year for their concert celebrating the King James Bible. They have performed at venues across the country including the National Gallery, the Buxton Festival and Durham Cathedral. Pierson is a professional actor and poetry performer, Yates is a member of the Monteverdi Choir and Chamberlain is an accomplished pianist and teacher. Tickets £5 - in advance or on the door- to include refreshments after the performance. The next meeting is on Tuesday 25th September at St Nicolas' Church at 7.30pm. Our speaker will be Mary Paterson who is coming to tell us about her Greek Pilgrimage. Everyone is most welcome. Our coffee and cake morning in aid of the MU Wheels Appeal was a great success. £235 was raised. Many thanks to those who helped, baked, and came and enjoyed. The members of Prestbury Mothers' Union support a project in Kenya, in particular a young girl called Purity. We give a small personal donation each month and in just over 3 years we have raised £1,642 - this money helps with schooling requirements, shoes, etc. for Purity. We are always pleased to welcome anyone who would like to come to our meetings - we have some jolly good times. A chat over a coffee is always on offer. Thank you so much for supporting my Coffee Morning on 4th August in aid of Robocap, a charity aimed at providing Robotics Assisted Surgery for prostate cancer. We raised £358.00.